For SUMD (preferred protocol) make sure the receiver is setup in the radio as SUMD OF #no channels and connected to the external radio connector (spektrum connector). 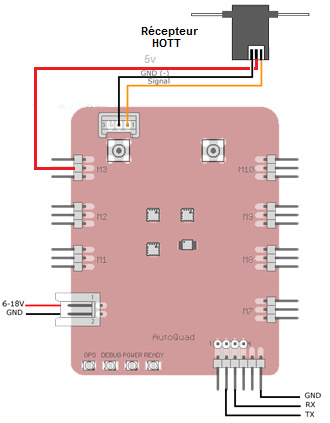 Use 5V from another pin or use the Telemetry Connector with 5v from the DIMU serial port. OF will make sure the internal receiver fail safe is disabled so AutoQuad can detect a signal loss! The #no channels can be anything between 6 and 18 channels, for a MX20 set the number on 12. This will make a setting of SUMDOF12. The SUM signal on HoTT receivers will always be connected to channel 8. More protocol implementation details in this thread. This page was created on 17-Oct-14 by MaxP. Last modified on 4-Dec-14 by kinderkram.